Around 1970, my dad took me to Ted’s Shoes to get me a new pair of shoes. I got the clodhoppers (tan colored boots that went up a bit past your ankle, like work boots). We came out and there was this sawhorse barricade. I wanted to show my dad that I could jump it, and so I did! I landed on the other side; it was wet cement. My dad was so angry because of the brand new shoes. The guy that was there working on the cement was angry too! The South Side of 100 block of East Court Street, looking southwest, probably late 1950s. Businesses visible are Ted’s Shoes, Capp’s Paint Store, Roy Shapiro Men’s Wear, and (on the second floor of right-most building) the Kankakee Moose Lodge. All buildings were demolished in the 1960s and 1970s (photo from the Kankakee County Museum archives). Transcription by Norma Meier of an oral interview with Laura Marcotte Hamende, March 5, 1981 (Laura Marcotte Hamende, 1887-1982). Reflections from her wedding day. “It was on a Wednesday. It was the 17th of April, 1907. Oh yes, we had Mass – High Mass. Oh yes, there was a lot of people there. A wedding used to be on a Wednesday all the time. Then they switched it off to Saturday. We thought it was terrible to have it on Saturday, but now it’s all Saturday. We had a dance, the hall is still there in L’Erable. I can tell you I wore a white knit dress. It had a blue silk lining. I had a cousin that made it for me. Of course, then we didn’t buy nothing made already. It was long, touched the floor. I had a veil. We got married in L’Erable at ten o’clock, and then we came to my mother’s for dinner. Laura married Arthur Hamende (1885-1955) at the L’Erable Catholic Church. Both are buried at Mount Calvary Cemetery in Kankakee. Interior and exterior images from St. John the Baptist Catholic Church in L’Erable, Illinois (photos from the archives of the Kankakee County Museum). In the earlier days of Kankakee County, grocery stores did not exist. When Rivard Grocery Store opened in Bourbonnais, and shortly thereafter Erzingers in Kankakee, and then The Big Bear on East Court Street, a good selection for grocery shopping became available. My mother worked part-time at Erzingers for several years. Erzingers later became The Fair Store, then Carson Pirie Scott, followed by The Kankakee Antique Mall, and finally a parking lot. I worked at The Big Bear in the produce section and as a bagger in the late 1950s. One of my more disgusting jobs was making up 10 pound bags of potatoes from 100 pounds. Many rotten potatoes were in the big bags, and I was instructed to put them in the middle of the 10 pound bags so they would not show! But the smell was terrible! The checkout lanes were all manual up to the time Wilson Christensen built a large grocery store at the northeast corner of Curtis and Jeffrey. It had the first automated check outs. Wilson had a son, Johnnie, who was a neighbor and friend I spent lots of time with. Johnnie had a new motor scooter he would ride around and stop by our place. One day he let me ride it down the E-Z Way Bumps Road. I only got about a half mile down the road and crashed it. I spent several days at St. Mary’s with a bad concussion and many cuts. Stores like WalMart, Target, and others are serious competition… I have great memories of early shopping and working in Kankakee. It was hard work but left me with experiences I will never forget. Erzinger Brothers Grocery Store exterior, located at 242 South East Avenue, Kankakee (from the archives of the Kankakee County Museum). As the summer is drawing to a close, I have to face the reality that school is starting again. Although I enjoy school for the most part, it is always a tough first couple weeks getting back into a busier schedule and not sleeping in at least once in awhile. I really hope you have enjoyed the blogs I have been posting. It’s been a blast writing and researching for them, and I learned a lot more about this area then I thought I would. There were so many interesting topics to write about! I started this internship in June, and I can’t believe how much I have done since! It has been a rewarding experience, and one that I won’t forget. The staff is awesome, and every day is exciting. I love coming and seeing the activities that are happening behind the scenes of the museum. Although my internship is coming to an end, I am very grateful for the opportunities I had. This blog has been much more successful than I thought it would be. For the posts I have written, they have been viewed in 7 different countries: United States, Canada, Puerto Rico (I know it’s not technically a country but I’m counting it anyways), Ireland, Spain, the United Kingdom, and Brazil. The most viewed blog was “Stars from Kankakee” with 718 views. There have been over 1,100 views due to the Facebook links posted, and more than 1,400 views altogether. These stats more than exceeded my expectations! Kankakee has many beautiful parks, especially along the river. I remember going to Bird Park and feeding the ducks when I was younger. We probably weren’t supposed to feed them, but they sure enjoyed it! There are quite a few parks here, and I was interested to see what history they entailed. I did not include every park in the district, but these histories stuck out to me. In 1912, Kankakee acquired the land at Sixth Avenue and Court Street. In 1927, the land became Alpiner Park in memory of Solomon Alpiner, the father of Mayor Ben Alpiner. In 1927, a $100,000 bond was issued to finance the development of the park. In July 1894, Emory Cobb opened Electric Park at the end of the Kankakee Electric Street Railway line. The park included a theater, a roller coaster, a dancing pavilion, and other amusement park attractions. In 1897-1899, the YMCA operated an Athletic Park in the same area. In 1931, Electric Park was acquired by condemnation for $56,625 and renamed Waterman Park for Frank Waterman, a fountain pen manufacturer from the community. The park held the Kankakee County Fair in 1938. In 1956, Waterman Park became Beckman Park, probably for Mayor Louis E. Beckman. In 1903, the location on the north end of Bird Park used to be the Kankakee Packing Company. The site burned down, but the plant was rebuilt with a 3-story building with 30,000 square feet. The south part of the park was the Home Provision Company. In 1907, Bird Park Quarry was sold to T. F. B. Sotham and renamed American Packing and Provision Company. The quarry closed and filled with water in 1911. By the 1920’s, Bird Park Quarry had a bath house and an artificial beach. Part of the $100,000 bond used to develop Alpiner Park also went to Bird Park. In 1928, Worth W. Bird, the owner of the quarry, offered the site of Bird Park to the district as long as he, his brother, and his wife were all given $500 a year for life. The district agreed to the terms and started to develop the park. The same year, Bird Park opened for swimming. However, by 1931, the State Board of Health advised the park district that the Bird Park quarry water was unsafe to swim for fear of a polio outbreak, leading to the beach being closed. However, the spot was still popular for fisherman. The quarry is restocked with bass and trout every spring by the Illinois Department of Conservation. The Hotel Riverview was located on what is now known as Cobb Park. Emory Cobb, also known for building the Electric Park, built the hotel in 1887. However, the hotel burned down in 1897 and was not financially able to be rebuilt. In 1900, Cobb sold the land to the city of Kankakee and it became “City Park”, Kankakee’s first official park. Later, it was renamed Riverview Park, and in 1956, the name changed again to Cobb Park. 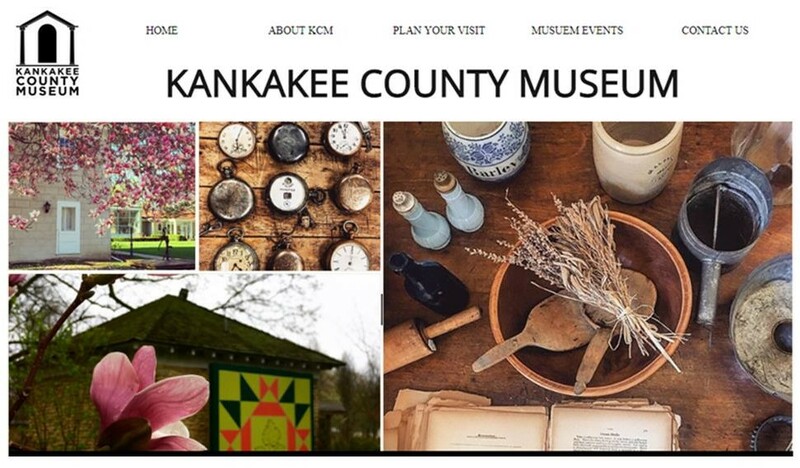 In 1976, the Kankakee County Museum moved here! In addition to the museum, the one-room Taylor Schoolhouse and the Dr. A.L. Small House is open as well. If you haven’t visited, it is well worth the stop! This park was the site of the old Kankakee City Quarry. It was a crushed limestone source for many years and opened between 1883 and 1895. This park was the original home of the Kankakee Fair. However, the fair was moved and the park took its place. In 1926, the Kankakee Stone and Lime Company quarry located north of Chestnut Street and east of Entrance Avenue is filled in and becomes Washington Park. The park was officially added to the park district in 1931. There is a time capsule buried in the Governor Small Memorial Park. It was put there in 1953 and not to be opened until 2053! Okay, so no one is really going to enter this fifth dimension. The Twilight Zone is one of my favorite tv series, and my sister’s favorite is Supernatural, so when I came across ghost stories and supernatural happenings in Kankakee County, I felt compelled to address it. I don’t believe in ghost stories, but they are still entertaining to hear. This story takes place on a farmhouse in ruins on Old Limestone Road. James Robinson lived in a blue house on a farm, but left to fight during the Civil War. Rumor has it that he was killed in battle, but there are records saying he drowned in Tennessee. His wife, before she knew he died, went to draw water on the farm, and a ghost in a soldier’s uniform was waiting for her back at the house. She did not recognize it to be her husband, but grabbed her daughter, and ran. Mrs. Robinson ran to her neighbor, Major Williams, and told him what she saw. A few days later, she learned that her husband had died. She ended up leaving Illinois and moving back to her parents in Pennsylvania. Since then, the house is said to be haunted by James Robinson, waiting for his wife to come back to him. This legend says a bus full of kids were crossing the railroad tracks in Kankakee a number of years ago, and it was hit by a train. If you pass over them at night, you can hear the kids laughing. According to a website detailing the haunted places in Illinois, if you stop on the railroad tracks, you can hear the sounds of a train coming and your car will start to roll off the tracks, like it was being pushed. Apparently, small hand prints are sometimes found on the cars as well. However, it did not cite an exact location where these things happened. This legend may be confused with another one, because there are many similar versions of this story in other locations. In the old theater center, there are said to be two ghosts haunting the place: an unknown child and Julie Remmington, the woman who first built the Majestic Theater. Manteno State Hospital closed in 1985, but most of the buildings are still standing. There are also underground tunnels, mostly still intact, that connect all of the buildings. This has been featured on television shows and rumored to be one of the most haunted places in Illinois. Legends say that the spirits of the patients are still around because of the inhumane treatments performed and the typhoid outbreak that killed 60 people. This legend says that you can hear a papoose crying out in October, especially if there is a south wind. If you go east on Court Street, out of town heading towards Momence, past the Kankakee River bridge and pull over to the left, you will see elm trees along the water. This is where you can hear the papoose crying out. The Potawatomi would entomb infants in a hollowed log and place them in the branches of elm trees. According to the legend, the infant you hear is the son of a chief. The famed Paramount theater is said to have been haunted by a previous janitor named George. Employees say that his presence can be felt, and sometimes you can hear doors opening, especially to the refreshment stands. If you listen carefully, you can sometimes hear the clanging of his keys. Although not technically in Kankakee County, this may be the most famous paranormal story this region has to offer. It has become the subject of “The Possessed”, a documentary from 2009, and two books. The story starts in 1847, when a 6-month old baby named Mary Roff started having fits. Now she was believed to be epileptic, but she was put into a Peoria asylum. Mary Roff died in 1865 at the age of 18. 13 years later, a neighbor and 13-year old girl named Mary Lurancy Vennum (called Lurancy) was found in a trance. When questioned, she said she was an old lady, a young man, and then finally named Mary Roff. She also had the same ‘fits’ as Mary Roff. Mary’s mother, Asa Roff, believed in spirits and thought this truly was her daughter coming back to see her family. She convinced the Vennum family not to have Lurancy committed. She continued having this possession for 10 months. When Roff’s spirit finally departed, Lurancy was able to return to a normal life. She ended up moving to Kansas, marrying a farmer, and having 11 children. This is believed to be the first documented possession in America. Tours were available of the Roff home, but closed in 2015. According to the Daily Journal in 2013 (which also depicted some of these stories), City Tavern on West Ave. in Kankakee brought in a team from the Illinois Paranormal Society to investigate a spirit that would push visitors up the stairs after being in the basement. There were no specific results, just that the team was still investigating some leads. There is likely no truth to most of these stories. However, they are fun to hear and ask “what if?” There are probably a lot more stories and legends that are told that I did not come across. I looked through my research materials here at the museum, the Daily Journal online, and a short Google search. Feel free to leave comments if you know of any fun paranormal stories to share! The first automobile theft in Kankakee happened in 1914.